There seem to be two themes to this week – endings (Ex Machina, Air, The Light) and Avengers (Academy, New, Secret). When Ex Machina started back in 2004, it really stood out on the comics stands. On the surface, it was a superhero book, telling of the adventures of The Great Machine, the hero of 9/11 (he stopped one of the airplanes, thereby saving one of the twin towers, although the other still collapsed). The thing is, by the time the story opened, The Great Machine had hung up the jetpack, and was instead taking office as Mayor of New York. What followed, over a stellar fifty-issue run, was what could be the first truly political comic. As Mayor, Mitchell Hundred sounded off on any number of controversial issues, such as gay marriage, abortion, terrorism, and others. The book was squarely grounded in New York City, and incredibly smart. In the background, there were always hints of a threat from the interdimensional beings that gave him his powers, but this book was about city politics first, and Hundred’s relationships with friends, family, and employees second. And I think that’s why I’ve enjoyed this book as much as I have over the years. The last few issues, where Vaughan was rushing to get the Suzanne Padilla threat from beyond plot over with, kind of lost their focus on Hundred and his people, so this issue was a huge treat. In it, Mitchell basically deals with the consequences of the craziness that happened, including the legal ramifications of his putting his superhero suit back on. Hundred’s one of those teflon kind of politicians, so in no time, he’s back on his feet serving as Ambassador to the UN, something that had been hinted at before. This issue is full of surprising character moments, from Bradbury’s drunken revelation to Kremlin and Mitchell’s last conversation. Some of the biggest surprises of all come from seeing where Hundred’s political career takes him, which I’m sure will have lots of fans talking, but I found it made perfect sense, as well as giving the book one last jolt. In the end, this was a pretty experimental book, which can be considered a huge success. Vaughan’s writing has been great, and Tony Harris, who was an amazing artist when the series began, has become even better. This issue is absolutely gorgeous. I can’t wait to see what these two are going to be up to next (hopefully soon). It’s a shame that Air is ending, but at the same time, that a book like this can get a two-year run in today’s market is impressive. Air is one of those newer breed of Vertigo books, like Sweet Tooth or Northlanders, that is more concerned with exploring a notion than with telling a traditional, dark fantasy story. It took risks, was never very popular (sales demonstrate this), and should be considered a complete success of intelligent storytelling. I’m thankful that Wilson was given enough space to finish off her story, because an overly-rushed ending would have done a great disservice to what she had planned and so clearly mapped out. In this conclusion, I feel like there may have been some corners cut – we never really do get a solid explanation of what Quetzalcoatl represented, and I would have loved to see more of Blythe’s adventures in flying – but there was more than enough space to come to a satisfying conclusion. This book started out being about the fear of flying (and not in an Erica Jong way – that came later). Blythe, the stewardess, was technically afraid of falling more than falling, and the Etesian Front were a shadowy anti-terrorist network that wanted to make the skies safe for all Americans again. It’s interesting that this book morphed so quickly into what it really was – a comic about the power of symbols, and the story of Blythe’s journey of self-actualization, as she took on the role of a hyperpract (the ability to fly through reinterpretation of maps and symbols). At the beginning of the series, I didn’t like Blythe that much, but now at the end, I feel like I’m going to miss her. Wilson did a wonderful job on this book. She invested a great deal of personality into her characters, demonstrated a novel approach to science fiction, and used the book to transmit some of her personal beliefs. I especially liked the issues about Zayn and fundamentalism. Perker was a great artist for this book, and was consistently excellent throughout the run. I hope that Air is one of those Vertigo books that finds new life through trade sales, and that Wilson and Perker work together again soon. There are two stories in this issue of CBGB, of vastly differing styles and appeal to me. The book opens with a story written by Ana Matronic, who is apparently in a band called the Scissor Sisters (should I know who they are? ), and drawn in a style that seems like a cross between Becky Cloonan and early (ie. Shade the Changing Man era) Chris Bachalo. In this story, the narrator is a writer with a bad case of writer’s block, in 1970s New York. Her only true release comes from attending shows at CBGB, and writing about them for the Village Voice. It’s a very nice piece, and works as a great tribute to a very specific time and place. The second story, by Mr. Sheldon, is cute I guess, but completely not my thing. This is a pretty cool comic though – I like that Boom is trying something so different from what they usually publish. Regular readers of Chew have come to expect certain things – sharp humour, and compelling storytelling being the main attributes. What’s cool about this series is that the creators don’t leave it there. Layman has been increasingly experimental in the plotting and pacing of his stories. Last issue began with a page that was ‘out of order’, effectively foreshadowing where Tony Chu was going to end up later in the book. This month’s issue takes place between the pages of last month’s. It’s not a gimmicky Rosencrantz and Guildenstern Are Dead kind of thing, it’s simply a creative way of telling a story that helps to fill in some of the mysteries that have been building around this title for some time now. The comic opens with the Tarantino-inspired scene on the cover, as Caesar, previously seen as the black ops guy for a company that combines chicken and frog DNA (Fricken! ), is revealed to be a deep undercover FDA agent (and that sentence right there is enough of a reason to go buy this book as far as I’m concerned). Later, said Fricken (actually called Poultplus on the cans), is receiving a lot of attention, and Tony and his partner raid the facility. There’s a lot of crazy, funny stuff going on within this comic. I particularly like the strained relationship between Tony and his boss. This is a book that keeps getting better with every issue, and is well-deserving of the Eisner it won this year. Fables has returned after a skip month, and we finally get to the end of Rose Red’s long conversation with her dead mother, as we see just how horribly she acted back in the Homelands, when she was living with Snow White and Prince Charming. This part of the book is amusing, but it is when this bit ends, and Willingham returns to the main storyline, that things get pretty good. Gepetto has a meeting with Stinky and Ozma, while Bigby worries about how long he can resist Mr. Dark’s power, and Beauty feels a few kicks. I feel like most of these plots have been left for too long, so I look forward to getting back to the main business at hand. I just recently re-watched the fourth season of Farscape, and followed that up with the Peacekeeper Wars , which served as a nice refresher on the state of the Farscape galaxy before reading this issue of the now very good Farscape comic. In this issue, Chricton and Aeryn, along with the PK deserter Captain and her Lieutenant scout out the weapons that Commandant Grayza is preparing to sell to the Grennij, who are advance troops for a larger invasion force crossing an inter-dimensional divide. Later, the gang meets with Grayza, which always works well, as she must be an insanely fun character to write, so full of certainty and hubris. As I’ve written a few times recently, this comic has gotten very good since it became an on-going series. DeCandido has these characters down pat, and it’s cool to see the way he and O’Bannon are working in the series’ history to recent events. A good example of that comes in this issue, where the commerce planet they visit is the same one that was visited in the very first episode of the show. Most interesting to me is the way in which Aeryn is developing her own vision of what the Peacekeepers should be. It’s been clear that she never really accepted leaving the service, and now that she has discovered her spiritual side through studying the Books of Yemahl, it is nice to see her work to implement her vision. This was a very cool little mini-series. The Light is an interesting variation on the typical zombie story. Something in transmitted light (streetlights bad, headlights good) is infecting people and burning them up. Coyle, a drunk and wife abuser, is trying to keep his teenage daughter Avery alive, despite the fact that she hates, resents, and even blames him for everything that is going on. In this issue, Coyle is being chased by one of the men he had been traveling with, but is also still hoping to knock out a major power plant in the hopes that it will protect anyone still alive. The issue is fraught with suspense, but it is the truly dysfunctional relationship between father and daughter that makes the book work so well. In the textpiece at the back of the book, Edmonson talks about the usual portrayal of light in literature as being inherently good and beneficial. It’s very cool that with this series, he and Weldele flipped that idea, and made light something to be feared. This title should read great in trade format, and I highly recommend giving it a chance. The Sixth Gun has been a pretty enjoyable mystic Western, but it was a little unclear at times. With this third issue, Bunn provides a ton of exposition and explains the backstory surrounding General Hume and the strange guns at the centre of the book. Most of this exposition comes from Drake Sinclair, as he journeys away from the resurrected Hume, and tries to protect the girl that now possesses Hume’s gun. It’s pretty clear that Sinclair is hiding some secrets and has a particular goal in mind, and it is this lack of clearly recognizable heroes that makes this book work so well. With each issue, I find myself liking this title more, and I’m very curious to see where things are headed next. I picked up the first issue of Sweets on spec – it looked interesting, but I wasn’t sure if I was going to stick with it. I liked it enough to want to get the second issue, and now I’m hooked. On the surface, Chamberlain is giving us a straight-up police procedural that reads like some of the best episodes of Homicide Life on the Street. The two lead detectives on the ‘Sweets’ case – a string of murders connected through the pralines left by each victim’s body – argue, grumble, and carry on like the frequently cantankerous cops on that much-missed TV show. At the same time, Chamberlain continues to play with the comics form, giving us the odd page featuring the killer, always in black and white, and another short look into his childhood, drawn in a much more simplistic and primitive style. On top of it all, the story is set in New Orleans just before Hurricane Katrina hits, which will probably factor in to the end of the series. This is a great example of a solid crime comic. Anyone who enjoys Criminal should pick this up. My store got short-ordered on the first issue of this mini-series, and it took a while for me to finally track down a copy, which meant that I got to read the first two issues back-to-back, and that was definitely a treat. I really liked the original Welcome to Tranquility series, which was set in a small town populated by retired super heroes and villains, and their families. It had a nice Picket Fences oddball vibe going for it, and the comic was filled with likable characters, most especially Sheriff Thomasina Lindo. Then, Wildstorm mandated their Worldstorm crossover, and the book went into what I thought was an indefinite hiatus. Now, Simone has brought back these characters, and is joined by the able Horacio Domingues, whose art on this title is so close to original artist Neil Googe’s, that I didn’t realize a switch had been made at first. The story picks up shortly after where the series left off. The murderous Mayor Fury is being released from jail after a key witness changed her testimony, and the town is preparing to welcome him back. There is a strange outpouring of love for the Mayor upon his release, and the citizens of Tranquility have prepared a surprise for him at his wife’s restaurant. The only problem is that someone else shows up, who is supposed to be dead, and the Mayor and the two cops driving him, including Lindo, are attacked, and the Mayor taken prisoner by a new character, with a close connection to Fury. As always when Simone is let loose, the writing is incredibly sharp and funny, but also well paced and plotted. This is one of those quirky books that Wildstorm used to be known for, and which deserve way more attention than they get. This new series is new-reader friendly; you’ll be brought up to speed in no time. Avengers Academy #3 – Gage is doing such a great job of building these new characters. Having each narrate an issue has been a good technique to let the reader into their heads, and has shown that he really has a handle on their personalities. The adults, on the other hand, are looking more and more foolish. The whole notion of a ‘Scared Straight’ style intervention with the Thunderbolts comes way too early, unless this is the mandatory third issue guest star thing at work. Also, Speedball as a cutter? Again? Please finish with that. All in all though, I really like this comic. The scene with Valkyrie is classic, and worth getting the book for alone. Buffy the Vampire Slayer: Riley One-Shot – Okay, I remember Riley from his season or so on the Buffy TV show like a decade ago, but am I supposed to remember his wife? Was she on the show? I think that the people at Dark Horse need to remember that not all of us have encyclopedic memories for this type of thing, nor do we wan t to look up every second reference on Wikipedia. Same goes for the guy with the hat that’s chatting with Angel. I thought he was Badger from Firefly for half the first page he was on. Other than that, I guess this comic really only exists to explain why Angel did the whole Twilight thing in the first place, and in that it serves its purpose. It’s not a bad book – it has some nice dialogue between Riley and Mrs. Riley, and Moline is a good artist – it’s just a little too much like a footnote. DV8: Gods and Monsters #5 – Wood continues his examination of how messed up powered people would have interacted with primitive cultures, this time having two of the DV8 crew living with the same group of vaguely Mongol nomads, although they have two very different experiences. I like this book, but don’t have too much to say about it. Green Lantern Corps #51 – I think I’m starting to lose interest in this title. Although I like Bedard’s writing, I feel like this arc is a placeholder before something Brightest Day-connected comes along, and BD is not doing it for me at all. I do want to see the Alpha Lanterns done away with though; they were not a good idea. New Mutants #16 – There are two important things you should know about this issue of New Mutants: 1. The only New Mutant or X-Man who appears is Pixie, and only for two panels. 2. This is by far the best issue of this run so far. Instead of following everyone’s favourite ex-X-Babies, Wells gives us the backstory on General Ulysses and his men, explaining how they came to be stuck in Limbo for so many years. As it turns out, following the Inferno crossover, the government opened a research post in Limbo, and had with them the mutant babies that the Goblin Queen had used to open her portal. This is some serious black ops stuff, and it helps to explain why Ulysses and his men seem so crazy. Very cool work. 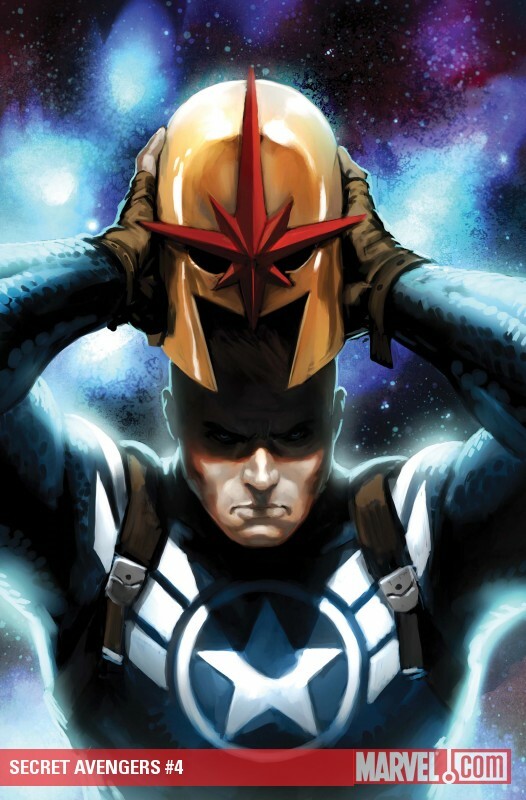 Secret Avengers #4 – Thi s was a decent Avengers cosmic fight comic. If you forget entirely the stated purpose of this team/book, it’s easy to get into it, even though a number of characters just stood around watching the bigger players fight. I’m not sure how the next issue is going to square with a lot of the work that Hickman has been doing with Nick Fury in Secret Warriors though – there’s been enough retconning with this character lately, I don’t think we need more. I’m hoping for LMD… I like the work Deodato’s doing with page layouts on this comic. Thunderbolts #147 – It feels like Parker and Walker have hit their stride on this title, as they really begin to nail some of the characters (that’s the first that Cage has felt like Luke Cage). This issue is nicely integrated into this week’s Avengers Academy, and perhaps spoils the next issue of that title a little (unless you really thought someone might kill Norman Osborn). This book was teetering on getting dropped, but may have just rescued itself. Uncanny X-Men #527 – This was another very strongly written issue of Uncanny, with both Logan and Namor questioning Cyclops’s ability to lead, and Emma Frost sitting down to dinner with powerful men. There is another new mutant introduced (I hate the Fiv e Lights name), and a nice chunky role for Cecilia Reyes, a wickedly underused character, to play. The problem with this issue is that Whilce Portacio should not be drawing a comic that is mostly about personal interactions. He’s not very good at faces, and in more than a few panels, Frost looks like she might have a lazy eye, or a secondary mutation that allows her to look in two directions at once. This would have been a great comic had it been drawn by the Dodsons. Ides of Blood #1 – This looks like an awesome project, but I’m not going to drop $4 when I don’t know the creators involved. While I’ve been enjoying reading John Ostrander’s wonderful Star Wars Legacy series, I got a little confused when it came time to find a copy of volume six. 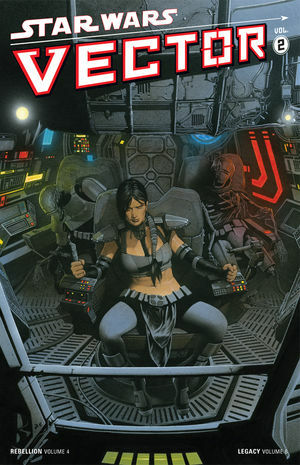 As it turns out, it’s because volume six is really volume two of Star Wars Vector , a novel crossover idea that was tried out in all the Star Wars series a couple of years ago, and which is sure to confound new readers. Vector is about Celeste Morne, a Jedi who has become bonded to a Sith artifact known as the Muur Talisman. It holds the spirit of an ancient and long-dead Sith named Karness Muur, who is in constant battle for control with Morne, and also gives her the ability to turn any creature into a Rakghul, a mindless monster. Volume One of this series contains the Knights of the Old Republic and the Dark Times issues, whereas this book covers off the Rebellion and Legacy legs of our tour. Not being too interested in Star Wars books not written by John Ostrander, I just picked up volume one. The Rebellion story is okay. It seems to take place between the first and second Star Wars movies (Episode 4 and 5, for people that want to acknowledge the newer films), and features a still-green Luke Skywalker, and all the rest of our favourite characters. What is most notable about this story is that the art is by Dustin Weaver, who is currently doing very impressive work on Marvel’s oddball SHIELD comic. Everything else is pretty forgetful. Then we get to the Legacy part of things, and it all takes a turn for the better. Ostrander integrates Morne and her story with his ongoing plot perfectly. We meet up with Cade Skywalker and his crew as they make their way into the Galactic Core to set up their assassination of Darth Krayt, the Sith Lord that has been plaguing the galaxy. On the way, they come across Morne in a stolen Imperial Destroyer. They get her on-side in their mission, and lots of stuff happens. Legacy has to be the best Star Wars comic ever written (and drawn – few artists are as consistently great as Duursema), and I love the attention to detail, both in terms of character and in terms of providing a consistent and interesting setting for these stories that the creators bring to this book. Now this is exactly what I was expecting when the Vertigo Crime line launched. Bronx Kill is a perfect example of a crime comics graphic novel. It’s intelligent, suspenseful, very well-paced, and has a couple of surprises. The book stars Martin Keane, the only son in a family with at least four generations of service in the New York Police Department. The book opens with scenes of Martin’s great grandfather getting murdered in the Bronx Kill, the wasteland surrounding the stream that separates the Bronx from Manhattan, and then jumps to young Martin being told about it by his father. At that point, Martin realizes that he will never become a cop, and instead grows up to be a second-rate novelist. Early in the book, Martin marries Erin, an artist and school teacher, who bears a remarkable resemblance to Martin’s grandmother, who mysteriously disappeared, abandoning Martin’s father. There is plenty of animosity and disappointment between Martin and his Dad, and his wife’s constant curiosity about the family history does not help things much. After receiving scathing reviews of his second novel (Martin Amis was particularly cruel), Martin is lost for a while, before he starts to get a notion from his wife’s queries that leads him to Ireland for four months of research. Shortly after his return, Erin goes missing one night, and Martin is plunged into a world of suspicion and distrust. Milligan handles Martin’s decent beautifully, as he starts to crack up under media scrutiny and police suspicion. He eventually becomes the main suspect in the case. Strangely, all of these problems make it easier for him to write, and Milligan keeps cutting from the comic to pages of his first draft. It’s easy for the reader to make connections between Martin’s family history and that of Michael Furey, his protagonist. The art, by Romberger, works well with the story, and I find the format of these books – the thick hard covers with the pulpy newsprint inside, to be irresistible. This is a really good comic. I went in to this movie with very high expectations – I felt like the bar was going to be high for this project from the start, and hearing lots of positive reviews and good word of mouth for the last week only heightened my anticipation, and I’m very happy to say that I was not disappointed. This is exactly what a comics adaption should be. 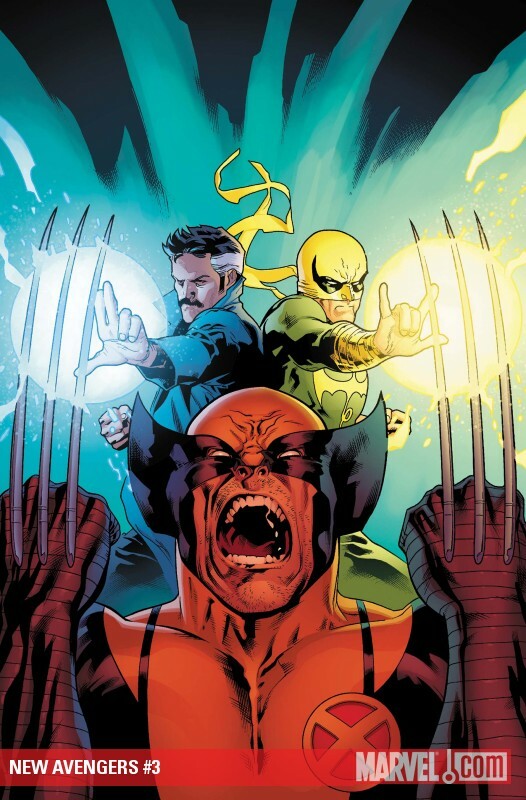 The story remained faithful to the comics, while effectively condensing Bryan Lee O’Malley’s sprawling plot, and preserving the unique aesthetic he crafted for the books. The plot is familiar – Scott dates Knives; Scott meets Ramona; Scott dumps Knives; Scott has to fight Ramona’s Seven Evil Exes, but there is enough difference to the film that it never becomes too predictable or boring for someone who has already read the story. The cute visual tricks help make the movie stand out. Sound effects appear on the screen, and the video game homages work better in the film than they did on paper. There are some very cool CGI tricks, but they never overwhelm the story the way they do in most blockbuster movies. The movie is cast perfectly. Michael Cera does a great Scott, but I found that Mary Elizabeth Winstead was perfect as Ramona Flowers. She managed the aloofness and indescribable cool of Ramona wonderfully. The other supporting characters were chosen well, especially Alison Pill as Kim Pine, Johnny Simmons as Young Neil, and Ellen Wong as Knives Chau, the source of many of the best laughs in the movie. One aspect of the film that I particularly loved was the way in which it portrayed Toronto as a magical, beautiful city. The scenes in places like the steps to Casa Loma, or along the streets where everyone seemed to live (the Annex?) looked fantastic, and it’s always cool to see places you’ve been hanging out all your life up on the screen. Out of necessity, the movie does cut a number of scenes from the book, and so things felt a lot more rushed than I would have expected. The quick succession of battles with evil exes didn’t give Scott and Ramona much time to really bond, and so I missed seeing many of my favourite moments from the comics in the movies. I also felt that Envy Adam’s character arc was cut short, but I understand why that had to be the case. Anthony Lane, writing in the New Yorker, suggested that the movie might be as ‘vaporous’ as the word ‘love’ that Knives exhales in Scott’s direction, but I don’t agree. I expect that this movie will find a solid life for itself on DVD and Blu-Ray, as it is the type of movie that may have a small audience, but I imagine they will be a dedicated one.